Jaguar was a post-war powerhouse with its C-Type sports cars that won France’s famous 24 Hours of LeMans twice in a 3-year period. The C was a straightforward sports car with a long nose and a 3.4-liter straight-6 that made 220 horsepower. 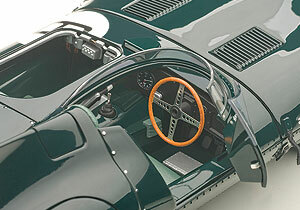 But by 1954 the competition, mainly in the form of Mercedes-Benz and Ferrari, was stepping up and Jaguar needed a new design that was lighter and faster, so its D-Type was developed with a distinctive stabilizer fin and airplane technology that included a monocoque cockpit and an aluminum alloy to keep the car light. Its shape was aerodynamic too, thanks to the design work of Malcolm Sayer, plus its frame was strong and rigid. Other developments included a dry sump lubrication system, canting the engine at 8.5 degrees and a deformable aviation style bag in place of a standard gas tank. Jaguar kept the underbody clean too in an effort to boost top speed on LeMans’s famously long Mulsanne Straight, where racers today can hit 250 mph. In 1955 the Jag was reaching 172 mpg vs. about 160 for other competitors. 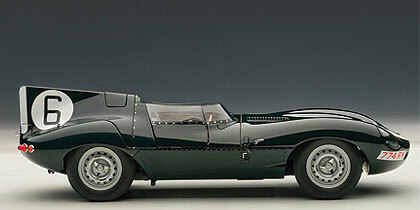 The C Type had been capable of about 120 mph. 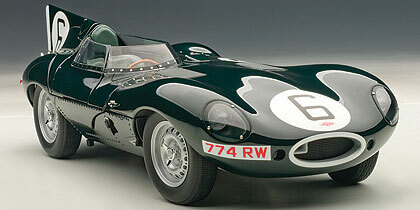 The result, the D-Type won second time out at LeMans in the tragic 1955 race. Jaguar and Mercedes had a terrific dual, but the Mercedes of Pierre Levegh crashed into the crowd, killing him and about 80 spectators. Jaguar’s D-Type had been leading, but the rest of the Mercedes team soon withdrew from the race, allowing Jaguar to take the win. 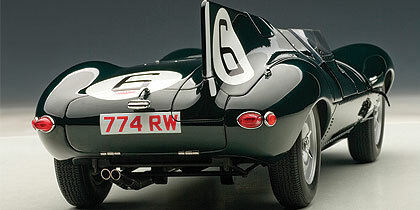 Noted F1 driver and eventual World Champion Mike Hawthorn and Ivor Bueb drove the D-Type to the win and it repeated the win the following two years, including filling five of the top six spots in 1957. Jag’s D-Type also was successful in many other sports car events during that same period, winning the 12 Hours of Sebring in 1955. But by the early 1960s rules changes and a less reliable 3.0-liter engine designed to meet those rules forced the D-Type to the sidelines. Jaguar didn’t win at LeMans again until 1988. Now Autoart does its usual superior job of creating this historic racer in 1:18 scale, from the 1955 racer’s elongated nose to that crisp fin behind the cockpit. In total, this model is expertly made of 391 separate parts, many are metal. Two key features that make this model unique are the second cockpit seat cover that pops off to expose a gray leather seat along with a dead pedal and emergency brake lever. A sliding latch will lock the cover in place, the way the car was raced. A removable panel reveals the Jag’s second seat. Second, in back there’s a small trunk (boot, to the British) with a cover that folds down on metal hinges. Plus there are several other finely hinged items here, including a gas cap cover in the fin behind the driver. Beneath that, and under the forward-opening hood are hinged gas caps too. 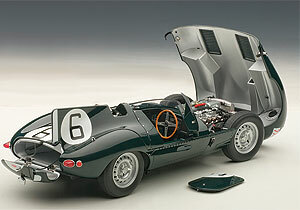 Under the car’s long snout (the 1955 model was known as the “long-nose” D-Type because 7 inches were added between the car’s debut in 1954 to the ’55 racer) is a replica of the car’s 3.8-liter straight-6 XK engine. 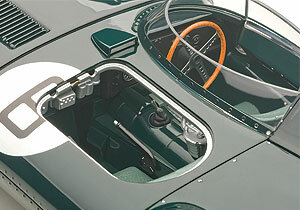 For ’55 a wide-angle head and larger valves were added to boost the car’s power to nearly 270 horses. Autoart nicely reproduces the engine with 3 Weber carbs and an intricate oil and fuel delivery system. This all looks simple compared with today’s motors, but the detail is good and black exhaust pipes feed out the engine’s left side to a detailed underbody. 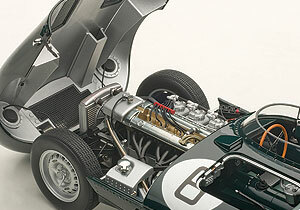 The D-Type’s simple 3.8-liter straight 6 is nicely detailed. Like the C-Type, the D has four wheel disc brakes and the front and rear suspensions are well executed for those who display their cars on mirrored bases. Tires and wheels also are realistic. For those of us more into the body work there are finely reproduced headlights with rivets printed in the black-edged shells. The tiny red taillights also look great and there also are rivets printed all the way around the tall windscreen that blends beautifully into the tail fin. Detail here includes two photo-etched metal grilles on the hood, which helped circulate air under the massive hood to cool the 6-cylinder engine in the real racer. And there are cloth straps and metal buckles along with chrome handles that turn to latch the hood into place. The cockpit is spartan, but you’ve gotta love the drilled-out 4-spoke wood wheel. Interiors in this era were simple and sparsely appointed. Beyond the gray leather seat there’s a large wood steering wheel with 4-spoke metal hub with machined holes. The Jag’s dash has a couple small gauges that are viewable through the wheel, and a larger one to the far left. Three pedals are on the floor and pads lie along the large transmission tunnel to save the driver some pain while racing. A small gear shift lever and boot sit amid the tunnel. The Jaguar’s body is perfectly shaped and slathered in a British Racing Green paint job, with simple white circles on the hood, left side, rear deck and right fin that include a black No. 6. There are molded in rivets at all the seams which also adds to the car’s authentic looks. In a word, the D-Type is gorgeous!